Dimensions: 8" x 4-3/4" x 10-1/2"
Dimensions: 16" x 6" x 13"
Dimensions: 16" x 6" x 19.75"
Gloss Paper Shopping bags give your retail store the quality image you are looking to represent your store presence. Shoppers have twisted paper handles and are able to be hot stamped with your logo. 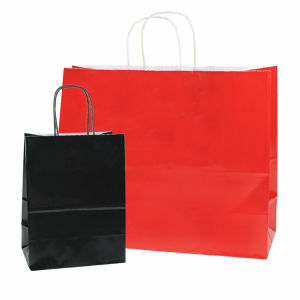 Talk to your customer representative about custom printing on these great sized shopping bags. Available in three sizes and four colors, please see below. • Cub and Vogue are 250 bags per case. Queen are 200 bags per case.